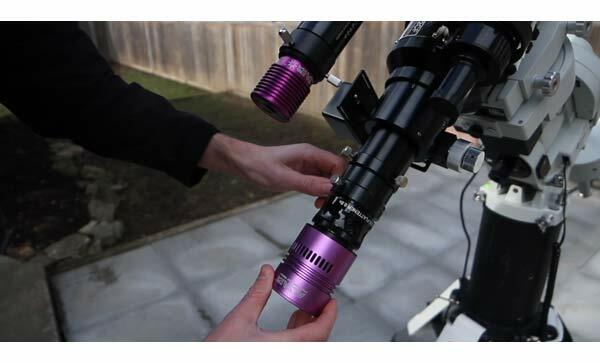 A mono astrophotography camera gives backyard imagers in the city the opportunity to collect dynamic narrowband images from home. Although LRGB image acquisition using a filter wheel requires some extra setup time early on, the flexibility of this configuration is appealing. Those of you who shoot with a one-shot-color astrophotography camera (such as DSLR) as I did for many years may be hesitant to switch to a camera that spits out black and white images. The satisfaction of a colorful nebula appearing on the back of your camera display screen after a 120-second exposure is why we got into this hobby in the first place. Make no mistake, a color DSLR camera remains the best options for beginners looking to get started in deep sky. I’ve spent the past 7 years doing so, and nothing will ever match the enjoyment of capturing objects in space from a dark sky site with a camera and telescope. Yet experienced backyard astrophotographers insist that monochrome is the only way to go if you want to get serious about your deep sky imaging. I took a lot of flak last year when I decided to upgrade from a DSLR to a One-shot-color Altair Hypercam 183C, particularly when shooting through narrowband filters. The results of my color camera + narrowband experiments were promising, but I knew those 12nm filters were better suited for a mono sensor. In this post, I’ll tell you why I’ll be shooting with a mono astrophotography camera from this point forward. But first, have a look at the Altair Hypercam 183M in action on the Cone Nebula. Why do serious amateurs recommend a mono camera over color? A monochrome astrophotography camera can collect more signal (light) than a color camera can. (3 times as much, to be exact). 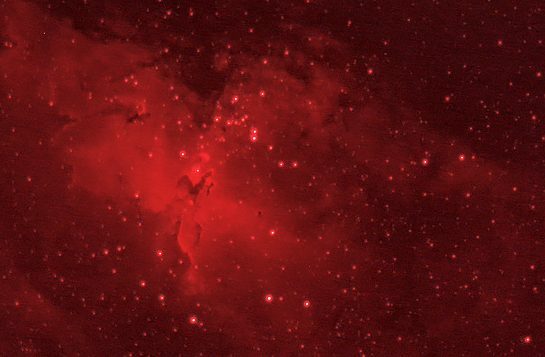 The Bayer filter array found in a color camera reduces the amount of overall light recorded on your astrophotography subject. By design, a camera sensor with a color filter array requires you to take longer exposures to record the same level of signal as a mono camera would. By automatically collecting light through your telescope into separate RGB channels as the light is collected, you are sacrificing the full potential of the light you work so hard to collect. In this article from PhotographingSpace.com, Dillon O’Donnell weighs the pros and cons of using a mono camera for astrophotography over color. In the end, it comes down to a trade-off between convenience and quality. A color camera will get you to the finish line faster but will hold you back in terms of image quality at a certain point. You may photograph objects through your telescope for years before you reach a point where you feel like your progress has plateaued. The bottom line is, a color camera is a jack of all trades, master of none. 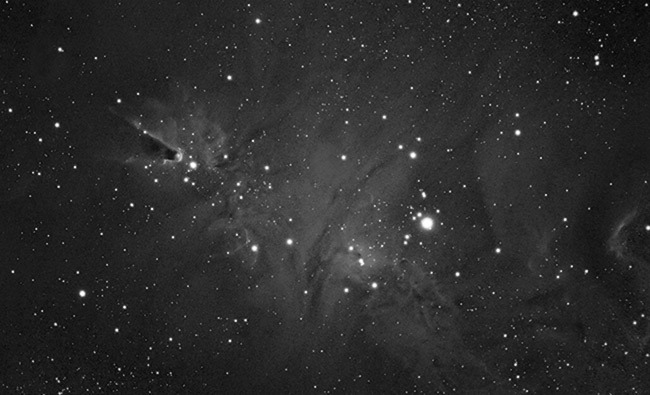 Left: The Cone Nebula using a monochrome camera and narrowband filters. Right: The Trifid Nebula using a modified Canon DSLR with an LPS filter. Let’s get one thing straight, my color astrophotography cameras (DSLR’s) will not collect dust on the shelf as I begin to focus on capturing images in monochrome. Creating beautiful full-color images of space will always be my primary goal. For most projects, I simply don’t have the time (clear skies) to collect all of my data using a monochrome camera with the necessary filters. In a nutshell, I’ll capture color images around the new moon, and narrowband mono images the rest of the time. I’ll never stop shooting in color with a DSLR, but new monochrome data will give my existing color images a real boost. Won’t it take three times longer to produce an image? 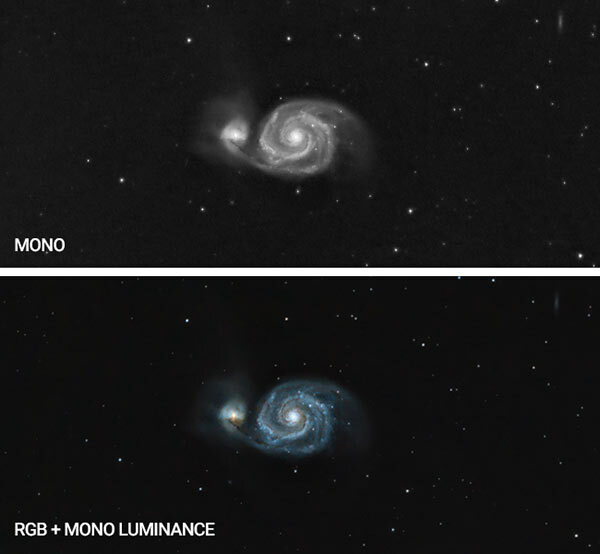 The added time involved with a mono astrophotography camera has been labeled a “myth” by some of the CCD manufacturers. Until I invest in a filter wheel and run through the entire process for myself, I can only speculate that this simply can’t be true. It’s possible that the overall image acquisition process time could be shortened due to the fact that more light is collected in each sub. Manually swapping out filters for each channel would tip the scales the other direction, but an automated setup including a filter wheel would speed this up. I thought a cooled CCD was the only way to go? 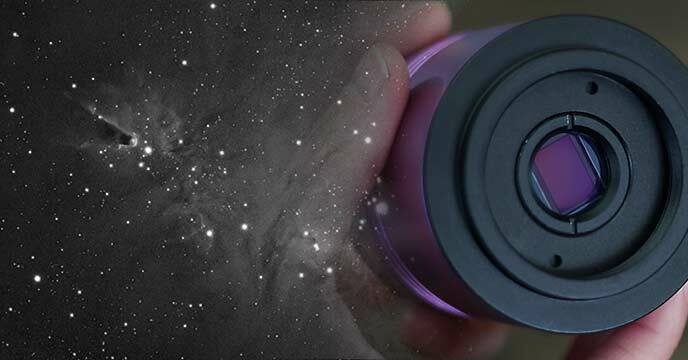 Everybody knows that a cooled CCD camera is the best choice for serious deep sky astrophotography, what’s all this about CMOS sensors (that DSLRs use)? Advances in CMOS technology have the latest astrophotography cameras that use CMOS sensors performing nearly as well as the coveted CCD. 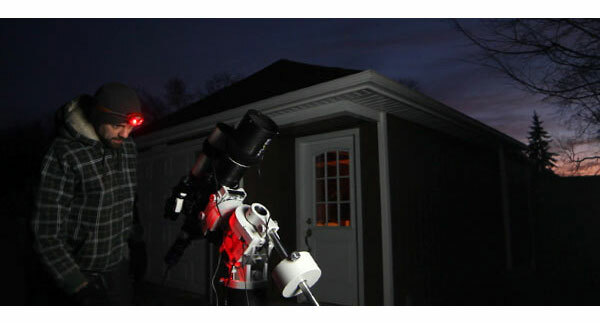 If you’ve been calling a non-DSLR dedicated astronomy camera a CCD, you’re not alone. Many software applications such as Astro Photography Tool label these CMOS astronomy cameras as a “CCD” to distinguish them from a DSLR camera. 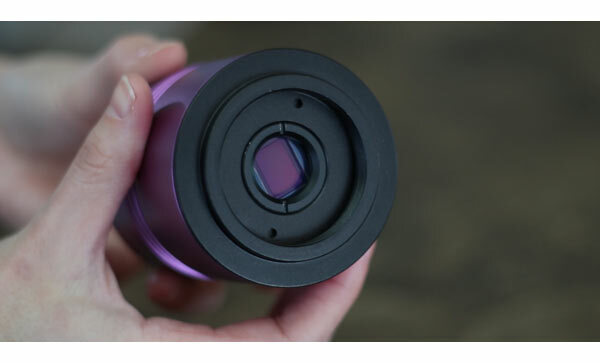 CCD cameras vary in price by a wide margin, from the tiny Orion StarShoot G3 Deep Space Camera to “the ultimate in astronomical imaging”, the SBIG STX-16803. For a wealth of information about CCD cameras, have a look at this video from Atik Cameras. Stephen Chambers, of course, references cameras from the Atik line, but much of the information he shares applies to all astronomy cameras. After several years of photographing deep sky targets in color through a Bayer filter, I am now realizing the difference a camera with an improved quantum efficiency makes. As you may have guessed, my heart once belonged to one-shot-color DSLR astrophotography. 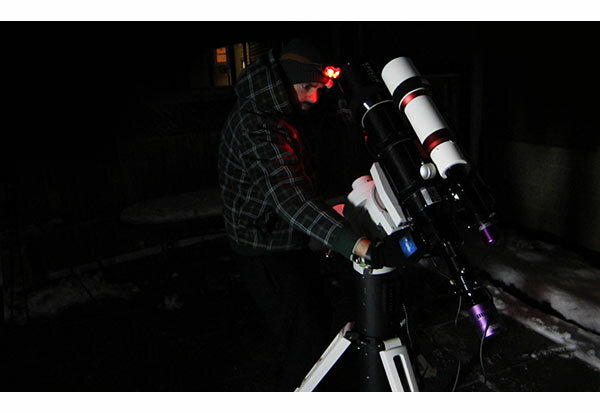 But, I am quickly realizing how a monochrome astronomy camera can give backyard imagers a tremendous advantage. It’s hard to imagine shooting with a color camera with a narrowband filter now that I have seen how much more detail can be acquired in mono. Have a look at this infographic shared by Atik Cameras. Today, I have in my hands a new Altair Hypercam 183M astronomy camera. This camera uses a monochrome Sony IMX183 sensor that can also be found inside cameras from ZWO and QHY. 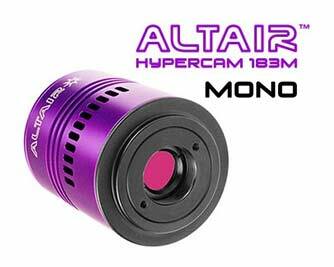 The Altair Hypercam 183M camera lacks thermo-electric cooling, which is a big reason it is more affordable than its cooled mono competitors. Even without a TEC system, the Hypercom sensor remains remarkably cool during a long exposure imaging session thanks to the open body design and fan cooling. I put the Hypercam internal fan design to the test last summer on the 183C, and I was impressed at the difference it made. On the hottest summer nights, the DSLR remained on the shelf while the Hypercam pressed on. The Altair Hypercam 183 requires the appropriate drivers to operate. You can download them from cameras.altairastro.com. I once believed that moving to a darker location was the only way I would be able to photograph faint and challenging targets. When you couple narrowband filters with a highly sensitive mono CMOS sensor, you’ve got what it takes to break through even the worst city light pollution. For now, I’ll focus on capturing luminance data or isolated narrowband gas details with the 183M. I can apply this new data to existing deep sky color photos for some added punch. Moving forward, adding a filter wheel to the mix will allow me to create completely new versions of my favorite objects. I’ll be sure to create a new Photoshop tutorial in the future that includes the process of adding a luminance layer to existing color images. The added “light” can make a dramatic impact on your images and provide some much-needed contrast and clarity to your photos. It is especially effective on nebulae with plenty of hydrogen gas. This time, however, my Explore Scientific ED102 was called into action, with the Altair Hypercam 183M attached. Also, I decided to sacrifice instant color gratification for more details. The image was shot the day after the full moon, and it was shining uncomfortably close to my target during this session. Image Processing in Adobe Photoshop. For the image above, I used an STC Optical duo-narrowband filter that isolates both Ha and OIII and blocks out almost all other wavelengths of light. 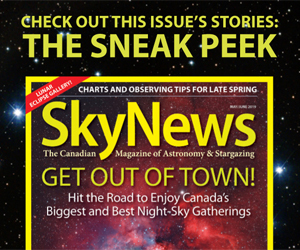 It’s designed to ignore city light pollution, while enhancing the wavelengths of Ha and OIII. Although this 48mm filter worked brilliantly with the Mono camera on the Cone Nebula, I need to test this filter with my DSLR. The Cone Nebula was my last imaging session with the winter targets, as objects on there way out to the West are not available in my backyard window. Galaxy season is approaching, and with it, come numerous new targets for deep sky astrophotography. This time around, I’ll shoot with a longer focal length to pull the often tiny subjects into view. The telescope I’ll be using is an iOptron Photron RC6. This will be a brief departure from my refractors as we head into spring. The timing couldn’t be better. Update: In early 2019 I added a cooled CMOS monochrome astronomy camera to my set up, the Meade DSI IV. This is a great resource from Diffraction Limited that provides a better understanding the importance of focal length, light sensitivity and resolution in an astronomy camera. This is the company responsible for the iconic SBIG line up of CCD Cameras. ZWO offers a wide range of high sensitivity CMOS astronomy cameras. To date, I have enjoyed the ASI071MC-Cool (Color) and the ASI294MC-Pro (Color). 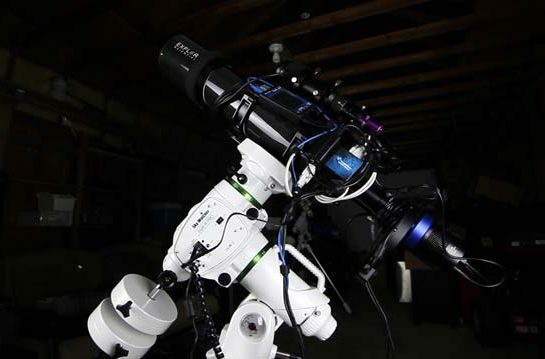 The ASI 1600MM-C is currently one of the most impressive monochrome astrophotography cameras being used by backyard astrophotographers around the world. i was astounded at your mono image of the cone nebula. The depth and detail were incredible, especially given the conditions that night (bright moon). Good work! Thanks for posting this Trevor. I am planning on doing the same thing, even before getting a new scope. Right now I am leaning towards the ZWO1600 although the ZWO183 or ZWO 178 might be OK. I entered the sensor sizes into Stellarium and compared them to the Canon T3i and discovered that the ZWO1600 is close to the T3i. The others are much smaller and would give a cropped image (smaller FOV). Unfortunately this have to wait as my wife was laid off in December. I’ve enjoyed all the videos you’ve done Trevor, you make it all seem easy. The look on your dogs face seems to say ,oh boy here we go again . I moved to imaging with a mono ZWO ASI1600MM-cooled camera with electronic filter wheel just over year ago and I haven’t looked back. Just one word of warning, the data you are going to get with these cameras is so much cleaner that it’s very tempting to over process the image which I’ve done on several occasions as I did last year with M51 which I have now reprocessed (which I believe you’ve seen on Twitter). One last thing keep the video clips coming I enjoy watching them. I wondering if it’s true that the total time (acquisition + processing) can be as short with a colour camera. I’m waiting for your experience with an automated setup to know it. I started my experiences with mono and I can say that if clouds come before finish one of the channels: no colour image that night. What about use Sequence Generator Pro for automation? Thanks you for your videos. My imaging time is only a little bit more doing LRGB then when I used a DSLR. With my DSLR I used to do 36 to 48 (3-4h) 5 min subs. With my “ZWO ASI1600 mm cooled” I do 1-2min for my luminance and 2-3min for my RGB. I can’t go much longer then this (unless I’m doing oiii/Ha bi-colour) as the quality of my skies Won’t let me. As for processing, I would say easier as you have cleaner/better data to work with but not necessarily quicker, I would say now I’m more formilier processing mono it’s about the same but then ever image is different. Last night (20th March) I imaged ngc4725, I did 60 Lum [email protected] and [email protected] for each R,G,B let’s see how that turns out, FYI the sky were not great but I was getting desperate for some imaging time☹️. As for clouds rolling in, I tend to do my luminance in one go at the beginning but split rgb in to batches, for example:- My imaging plan would take 8 Red 8 green and 8 blue subs and then repeat this 2 more times giving me a total of 24 of each, this way if the clouds roll in you hopefully have something of each channel to work with. Great Article! Those are some wonderful cameras. I’d like to switch (from DSLR) also. The disproportionate expense is a bit of a hurdle. I was wondering how much cooler the sensor gets with the cooling on the Altair 183M or 183C than a regular dslr. Im assuming its about 10’C cooler but there does not appear to be anything regarding this subject on the internet.Thanks. Congratulations fot your blog Trevor. I have a doubte, with your explorer scientific ED 102, with the reducer and this CCD you have a resolution about 0,82 arcsec/pix, really with the HEq5-Pro it’s possible to manage this requeriment? I live in Spain, it’s a hot weather country…, this not cooled CCD camera can be a good choice?. Please, I’m a newbie and I don’t understand how such a small mono sensor could be possibly better than APS- or full-frame-sized DSLR? I’ve been using the 183Cv2 in Australia and it isn’t cutting it on hot nights. I’m now waiting for the TEC version of the mono to be released. Hi Phil. I hear you. We’ve had a week straight of 30+ nights here in Ontario and I’ve opted for my cooled color camera in place of the 183M for the same reason. I’ll be demoing a new cooled mono camera next month! I have been vicariously enjoying your astro journey since I became interested 15 months ago. The STC duo band filter seems like a good fit for a project I envision; and might save swapping H-a and OIII filters in the cold. Did you purchase it directly from STC…or is there a North American (or better still…Canadian) distributor? With a monocam you get higher true color resolution, since the color information is collected separately for EACH pixel, whereas with the colorcam only 25% of the pixels collect red, 25% blue and 50% green. Color reconstruction is done computationally. What is missing in a 1shotcolorcam is the luminescence channel. You added that using your monocam to an older RGB (3 channel) image here. 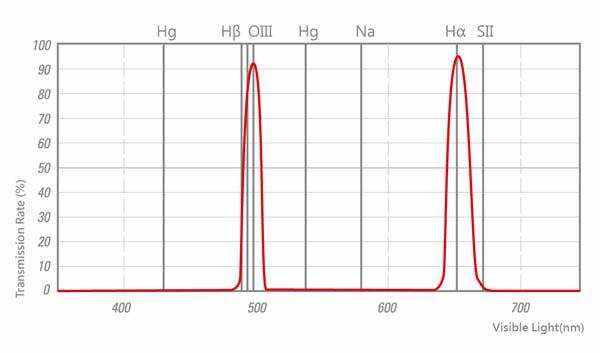 What is not optimal is using your monocam with a DUAL wavelength filter, since you are losing the color information from the two different wavelength. The DUAL wavelength filters are most useful with a colorcam, which will automatically process the image to reflect the colors of the two wavelengths. With a monocam you are getting more information using a single wavelength filter, since you can then reconstruct a color image later. You cannot do that with a dual wavelength filter, since that information has been lost during capture. Thank you very much for the information, Jo. I’ll stick to the color camera when using a duo-narrowband filter. I look forward to creating new color images using a monochrome camera and a filter wheel in the near future. Thanks again for the advice! Hello, I have ordered the STC Duo-narrowband filter for my ASI294MC-Pro. May I ask how do I stack the frames (each has both Ha and Oiii data) from Deep Sky Stacker? Do I just stack them the way I do it normally? What about processing in pixinsight? Do you have any web reference for me to check the processing workflow in PI for the duo-narrowband images? Thank you. Thank you, nice post. Actually I have an ASI294, do you think that could be interesting adquiring an ASI1600 mono to take images at once with two telescopes and combining them? (1600 for luminances and 294 for color). Thanks. I don’t know much about this, but does it make sense, if you now use red, green and blue Filters to get 3 Photos with separated color channels in 16-Bit, which might give a 48-Bit color Photo after processed in Photoshop or similar? Please don’t laugh, if this idea is too funny. If I want to use a monochrome camera just for that purpose i.e., to process all my images in b&w…… is it necessary to also still use the different LRGB filters…..do I still need them for better b&w images or will just imaging in monochrome be sufficient? As recently as 2013 I was still using my home darkroom developing and printing in b&w. There have been many DSO images that are more appealing to me in b&w than color….just curious, thanks.